366 devotions for the entire year. 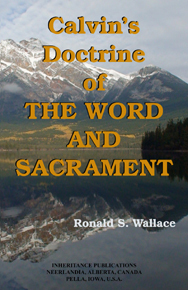 It includes Psalms and hymns and qustions or points for discussion. This is a careful and fresh study of Calvins Commentaries, Institutes, Sermons, and Tracts designed to meet the practical needs of those who wish clarification of the doctrines which lie behind traditional Reformed church practice. The book is also valuable for the insight it gives into Calvins method of interpreting Scripture, especially the Old Testament. In the preface the following two sentences aptly sum up the content and purpose of the work: "What is most important in the study of Calvin today is to reveal what the Reformer himself actually said, in order that misconceptions about his teaching may be cleared away. Therefore this work is not a critical study of Calvin but an attempt to express his teaching as copiously, fairly, and sympathetically as possible." All the commands and prohibitions of the Decalogue flow out of the covenant relation: "I am the Lord your God." That is the prologue to the entire law (Calvin). God thereby declares that He is the God of the Church. In light of these words the Reformer of Geneva expounds both the Ten Commandments as well as the summary of the law. For Calvin the law is the law of the covenant of grace. It is a confirmation of the covenant made with Abraham. Even though the law serves to bring out transgressions (Galatians 3:19) it is clothed with the covenant of grace (the covenant of God's gracious acceptance). 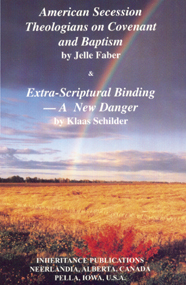 "It is a delight to be Reformed," wrote Dutch theologian Klaas Schilder (1890-1952), a man whose life and work demonstrated unwavering loyalty to biblical authority. While parting with Abraham Kuyper on some issues, Schilder shared Kuyper's conviction that "there is not an inch of human life about which Christ, who is Sovereign over all, does not proclaim, `Mine.' "
Jelle Tuininga in Christian Renewal: . . . The main purpose of Schilder was to dissuade and discourage Hoeksema (and the Prot. Ref. Churches) from adopting the so-called Brief Declaration. Schilder saw this, correctly I believe, as an "extra Scriptural binding" which would only lead to separate church federations instead of unity. . . I am happy that the publisher has made these essays available in English to a larger audience. The more so, because they deal with important issues which are now coming to the surface again. We must be informed on such salient points. 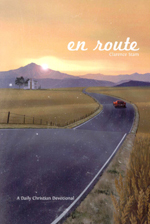 Cecil Tuininga in Christian Renewal: This book is easy reading as far as the English goes. It can, I judge, be read by all with great profit. . . I found the first chapter on The Significance of Dogmatology for the Training of the Ministry excellent. The six essays on the Church I found very informative and worthwhile. . . What makes this book so valuable is that Dr. Faber deals with all the aspects of the Reformed faith from a strictly biblical and confessional viewpoint. Included are the conference papers which were delivered for the general public in the evening sessions: Nehemiah the Rebuilder - C. Graham; Baptism with the Holy Spirit - J. van Bruggen; Christology - D. Macleod; Apartheid - J. Douma; The Tangun Shrine Worship and Radical Christian Movement in Korea - Ho Jin Jun; The Elder as Preserver and Nurturer of Life in the Covenant - C. Van Dam. Included are the conference papers which were delivered for the general public in the evening sessions: The Wrath of God as an Essential Part of Mission - C.J. Haak; Prophecy Today? - Norris Wilson; Catechism Preaching - N.H. Gootjes; Christology and Mission - Alisdair I. Macleod; Recent Criticisms of the Westminster Confession of Faith - R.S. Ward; Redemptive Historical Preaching - H.M. Ohmann; Remarks on Church and Tolerance - J. Kamphuis. Biblical Principles for the Relation between Church and State - R. C. Beckett; The Principles of Reformed Missions - Mark T. Bube; Challenges of the Charismatic Movement to the Reformed Tradition - Richard B. Gaffin, Jr.; Women in Office: especially about "deaconesses" - Soon Gil Hur; The Ministry of the Word amongst Asian Religious People (Hindus, Buddhists, Jains, and Zoroastrians) - David John. 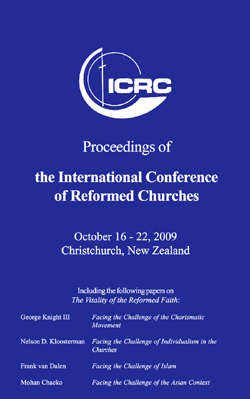 Proceedings of the International Conference of Reformed Churches June 20-27, 2001, Philadelphia, U.S.A. Included are the following papers: Biblical Principles of the Unity of the Church A Reformed (Continental) Perspective - J. DeJong; The Unity of the Church in the Westminster Tradition - W.D.J. McKay; Hermeneutics and the Bible - J. van Bruggen; Work Among the Jewish People: Historical Perspectives and the Contemporary Challenge - J.S. Ross; The Regulative Principle of Worship - G.I. Williamson; The work of the Holy Spirit in the Believer: Illustrated by the Spirit's office of leading the believer from regeneration to glorification - C. Pronk. Including the following papers: The Lordship of Christ in the life of the believer - A .J. de Visser; The Lordship of Christ in the Church - J.W. Maris; The Lordship of Christ Proclaimed to the World - Yonson Dethan; The Lordship of Christ Proclaimed to the World (2) - Yonson Dethan; Postmodern Apologetics and Evangelism - David Robertson. In The Covenant of Love the author deals with the importance and meaning of the covenant which the Lord has made with mankind. 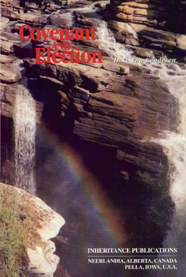 The main purpose of this book is to show from the Bible that this covenant is not a sterile contract between two parties, but a living relationship between God and his people. The only motive for this covenant is God's love and the only source of this covenant is God's grace. This love and grace have been amply shown in Jesus Christ, the great Mediator of the covenant. About the birth, death, resurrection, and ascension of Jesus Christ and the outpouring of the Holy Spirit. Epilogue: the return of Christ. Rev. Stam discusses many Bible passages that speak about the Person and the work of the Holy Spirit. It is specifically his purpose to show that the Holy Spirit perfects and completes the work of salvation in Jesus Christ. The Holy Spirit came to dwell in and with the church of Christ, His holy bride, to prepare her for the great marriage feast of the Lamb. Dr. De Jong's passion was to search the Scriptures and to bring its treasures new and old to the attention of God's people. With his insight into God's Word he was able to encourage, instruct, and comfort many when his meditations were first published in Clarion. The possibilities of human ingenuity and scientific advances seem to be limitless in our day. Plants are genetically modified to produce food that meets predetermined criteria. Basic building blocks of life are being manipulated for healing disease and improving health. However, the same basic techniques are used to produce cloned animals and there is much talk about doing the same with humans. Such scientific activities raise many questions. Speaking the Word of God confidently is the obligation of the preacher, insists James Daane, for the Word is not merely advisory; it is efficacious. When God speaks, the world does more than listen  it changes. This volume, demonstrating the main elements of Calvin's doctrine as they appear in his many commentaries on the books of the Old and New Testaments, speaks with singular power to the ordinary reader today. Included are more than two hundred selections under headings ranging from the Bible, knowledge of God, and Jesus Christ to the Christian life, election and predestination, and the church. Dr. Bilkes broaches the issue in his dissertation by way of the work of James M. Gustafson, R. Paul Ramsey, and Allen D. Verhey, three representative ethicists on the recent American Protestant scene. I pity a community that speaks about the tone and not about the contents and spirit of a matter. The brotherly tone may not conceal any truths which justice demands to speak. Some people are only frightened when the polemic tone becomes sharp. I am frightened when the matter is confused even when the tone is very mild. Ik beklaag een gemeenschap, die over de ,,toon" spreekt, en niet over de ,,inhoud" en over de ,,geest". De broederlijke toon moet geen waarheden verzwijgen, die de rechtvaardigheid gebied te spreken. Sommige mensen worden pas huiverig, als de polemise toon scherp wordt. Ik word het als de zaak vertroebeld wordt, ook al is de toon aeolisch. There are those in the Church today who are fearful about anyone who raises a question concerning the ambiguities associated with the formula "justification by faith alone." The exclusive particle sola introduced by Luther has undoubtedly performed a valuable service in signalizing the distinction between the Protestant and Roman Catholic doctrines of justification and in preventing the intrusion of merit on the part of man as a criterion of acceptability before God. The long and cherished tradition that lies behind "justification by faith alone" as a theological formula would make it appear to be an act of ingratitude, if not impiety, to raise the question of its adequacy as a summary of the thrust of the biblical doctrine of justification. Even so, it was the Reverend Professor Norman Shepherd's examination of the Scripture alone that gave him the courage to raise precisely this question. After all, there is the fact that neither the Apostle Paul nor any other biblical author uses the expression "justification by faith alone". It is true, of course, that Paul does use the expression "justification without the works of the law," and it is in these words that the theological warrant is traditionally found for defending the formula "justification by faith alone." It is true that the theology and the confessions of the church are not bound to the precise wording of Scripture, and the formula "justification by faith alone" appears to be a reasonable rendering of the sense of "justification without the works of the law". Traditionally, the matter has rested at this point with this explanation and it could remain here were it not for the fact that the text of the Bible expressly rejects justification by faith alone. James writes (2:24), "You see that a man is justified by works and not by faith alone." It was to Scripture-not tradition, and to James 2:24 that Professor Shepherd turned his attention. The consequence of his enquiry into the book of James and the sufficiency of the formula "justification by faith alone," was a controversy that shook Westminster Theological Seminary; the tremors of which are felt even today. [U]nless the documents cited in this study can be challenged as inaccurate, I believe this conclusion to be inescapable. 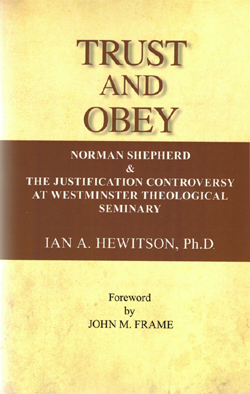 Here finally is a scholarly and objective treatment of the controversial events and issues leading to Professor Norman Shepherd's dismissal from Westminster Theological Seminary in 1982. Full of stunning revelations this is an indispensable resource for being informed about the "Shepherd Controversy" as well as for properly understanding the continuing debate surrounding his views on justification and related doctrines. Highly recommended! As one who lived through the "Shepherd Controversy," first as a student and then as a young faculty member, I read Ian Hewitson's account and analysis with great interest. His vivid and accurate narrative of the events brought back to my memory the difficult debates of three decades ago. His analysis of the dispute is sharp and to the point. " I enthusiastically recommend this book not only to the Reformed community at the heart of the controversy, but to all serious theological thinkers. Polemics can often be very harmful to the truth, and theological polemics are usually among the most harmful. From this point forward, only the person who has read Ian Hewitson's study deserves to speak and be heard regarding the subject and controversy in view. The Ninth Commandment requires nothing less. Thank you, Ian, for this compelling study!